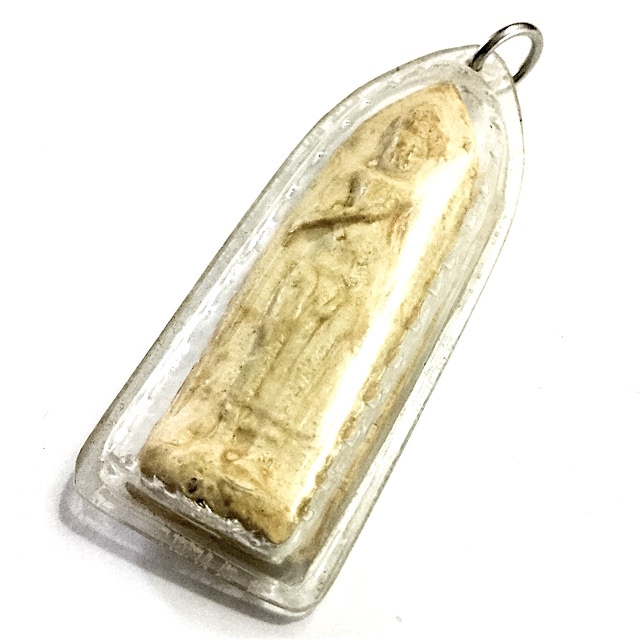 A rare example of the Pra Ruang Rang Pern standing Buddha amulet in Nuea Pong Gae Nam Man Oily Powders, with hand inscriptions on rear face from the Great Luang Por Guay Chudtintaro, of Wat Kositaram, in Chainat. The Pra Ruang, is a Classic Ancient Style of Amulet which has been found in Archeological finds of Kru Burial Chambers in ancient temples and Chedi Stupas, and has been a favorite amulet to make in many temples of the North and North East of Thailand. Luang Por Guay blessed his own editions of Pra Ruang amulets, but also blessed some other editions which were pressed at other temples too, which were brought to him to empowerment. The Pra Ruang has been found in both Lopburi and Sukhothai archeological digs, and is found in both Clay and Metallic versions. There are also sitting forms of Pra Ruang Buddha Images. There are various interpretations of who the Buddha image represents, the most common being that it is derived from the Pra Ruang Royal Family Lineage. It is the Pra Ruang Family who were the first and only rulers of the Sukhothai Kingdom Era of Thai History. King Pra Ruang was the father of Por Khun Ramkamhaeng, who invented the written Thai Language, and is revered as a Deity in his own right by Thai People. The rear side of the amulet has received hand made spell inscription from Luang Por Guay in ancient Khom Sanskrit. The Pra Ruang Rang Pern provides Klaew Klaad, Kong Grapan Chadtri, Serm Yos (Status Increase and Promotion) Maha Amnaj (Commanding Power and Influence), and Maha Lap for Prosperity. Usuallly this happens because of speculation by the collector scene, but in the case of Luang Por Guay's amulets, it has happened primarily for their Sacred Value, much much more than for their collectorship and artistic value, which is of course also extremely high. In addition, he would perform empowerments during the various 'Reuks' (Astrological Influential moments), to bring total coverage of protection and fortuitous blessings to all who might wear and Bucha his amulets. Luang Por Guay was famous for his Mastery of many different Wicha, including the Wicha of Tattooing Sak Yant. Every single edition of amulets he ever made are now rare classics and highly revered for their Magical Power. On the 1st September 2491, Luang Por Guay was elected Abbot of Wat Ban Kae. Luang Por Guay saw that the folk of Ban Kae were very poor and many people did not have enough to eat, and thus took up the practice of only eating one meal a day instead of the two before midday which are normally allowed for a Maha Nikaya Buddhist monk, in support of the people and to consume less.